(Obsolete - see Neutron Star 2). New low distortion 3 transistor hybrid oscillator. Precision better than +/- 0.2 ppm. Precise temperature stabilization at 37 degress C.
Insulated Signal Injection Point. (Voids Ground Loops). Ultrastable PTFE ( Teflon ) RF Trimmer. Mechanical size : 107 x 44 x 12 mm (p 25 mm). Rather than the usual RF shielding metal box, which doesn't exactly spell resonance free (try and tap on it), we used a special RF absorbing foam, as used in RF measurement laboratories. This cell foam also has a dampening effect on any mecanical vibration, that might reach the PCB itself. The Neutron Star has a few special features. 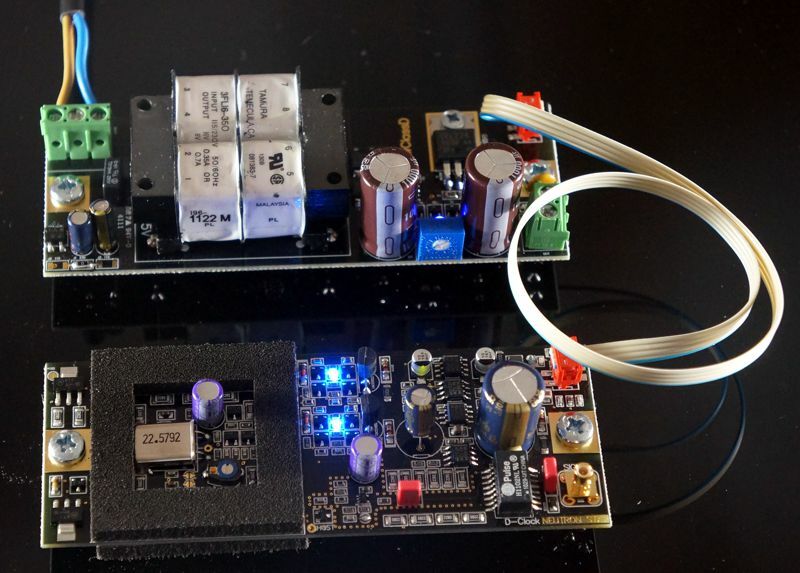 A circuit constantly monitors the noise on the power supply rails, if the noise is unacceptably high, a RED LED will light up to tell you, that you can benefit from using a cleaner power supply. The crystal and oscillator is placed on an isolated pad of the PCB, where power resistors and a thermostat keeps every temperature sensitive component at a constant 37 degrees centigrade. This allows for ultra high frequency stability. A green LED on the PCB will light up, when the correct temperature is stabilized. If it gets too hot or too cold, the green LED will turn off. Usually it takes a few minutes for the thermostat to reach the correct temperature, this is because we want to keep the power supply current of the Neutron Star absolutely constant. So the heating elements are kept to the lowest possible power consumption. Should you wish even further power supply current stability, you can add a solder bubble, to select 'balanced operation' of the heating system. This means that when the temperature is reached, and the heating power drops off, the exact same amount of power is dissapated in dummy resistor elements. So the power supply current will become dead stable as well. We adapted the successful potential isolator from the D-Clock, and to satisfy the users where the Neutron Star replces a metal can oscillator we added a special RF schottky diode, to move the DC potential up to the right level. A particularly important issue when designing an ultra performance clock is voltage reference noise. This is because you can filter the reference noise out with capacitance, but only in the higher frequencies. At lower frequencies, where the noise is most critical, capacitance will not remove the noise effectively. Therefore we had to look for the best available references in the world, for the Neutron Star Clock. We found that some of our competitors are using the AD589, in their reference clocks costing considerably more than D-Clock Neutron Star. So we considered this reference as an option. 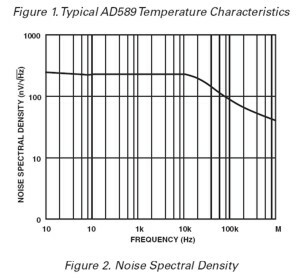 However it soon turned out that the AD589 is far noisier than the reference we usually favour, for critical applications, including our regular D-Clock. The LM329. Look at these figures, and compare yourself: (Both curves taken off the datasheets of the respective references). AD589 Noise Figures. LM329 Noise Figures. As you see AD589, generates around 14 times more noise than LM329. Even at 10Hz, where the LM329 is at it's weakest point, the AD589 is still 9 times noisier (at 5V rail voltage). MAX6126 does not specify noise voltage at 10Hz, so it cannot be directly compared in this context. 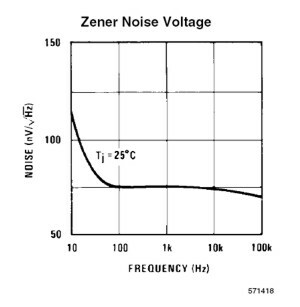 Noise in the Zener reference usually translates directly into phase noise on the clock signal delivered. All of the figures above are significantly better than standard voltage regulators like 7805, LM317 or even the somewhat better TL431A. The Neutron Star can be supplied from any clean 12-15V DC supply of at least 200mA, for example the internal power supply of the CD player. 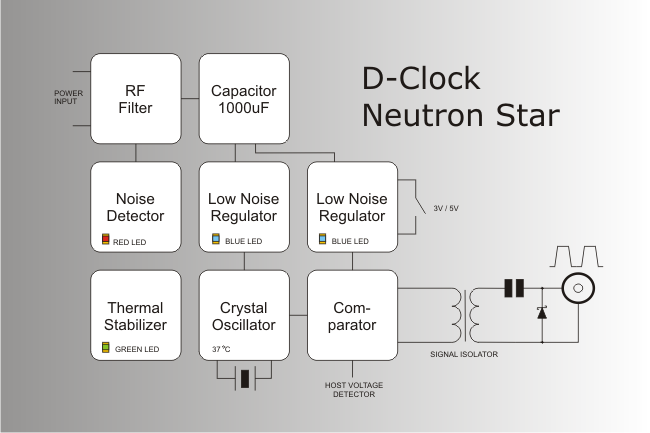 We offer also a low noise power supply for Neutron Star for optimised performance. Now available in 100.000 MHz femtosecond version for use with ES9018. A note on so called Femtosecond Clocks, and clocks with Femtosecond Jitter performance. A new breed of audio clocks are emerging on the market claiming jitter performance as low as two digit femtoseconds, like 50 or 70 femtoseconds.  (We claim <1 pS = 1000 femtoseconds). The 50 femtosecond performance does not have to do with a spectacular new technology for building clocks, but rather the way jitter is measured. If you wiev jitter graphs for any clock you will find that the jitter is lower at higher frequencies. The jitter in 'femtosecond' clocks are usually measured from 12 kHz to 20 MHz, so mostly out of the audio band. This gives a very nice low jitter figure on paper, however it does not necessarily measure sound quality. We always specify our jitter performance from 10 Hz to 50 kHz. View Machine drawing of this module. 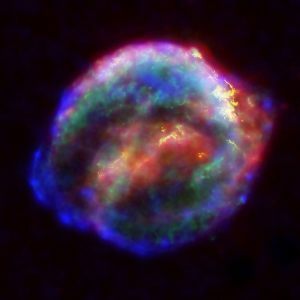 A Neutron Star is the remains of the collapsed core after a massive star has exploded in a Supernova. The Neutron Star is about 10km in diamter, but has the mass of our sun. This means it is extremely dense, actually a teaspoon of neutron star material would weigh millions of tonnes. Because of the small size, and huge mass, rotating Neutron Stars are impervious to outside gravitational disturbances and thus have very stable rotational speeds, over millions of years.